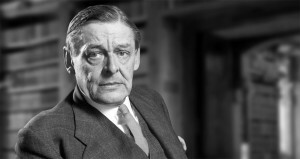 Thomas Stearns Eliot is buried in the Parish Church of St. Michael, East Coker, Somerset, England. He was cremated at Golders Green Crematorium and his ashes were interred below his memorial plaque on Easter Sunday 1965. Eliot’s ancestors originated from East Coker before emigrating to America in the 17th century. East Coker is also the title of the second of the long poems that make up The Four Quartets.